Whatever your mental image, Captains Flat is nothing like it. A town nestled into a valley with the hills around scoured of trees by constant mining. It is a rare mixture of interesting historic buildings and rather rundown residential areas which seem to hover on the edge of poverty. Located 343 km from Sydney and 60 km from Canberra, Captains Flat is 922 metres above sea level. It was inhabited by the Ngarigu Aborigines prior to European settlement. People passed through the area as early as the 1830s but it was not until the late 1870s, when gold was discovered, that the town really developed. It is local folklore that the town was named after a bull. Apparently there was a large white bullock, part of a bullock team, who used to slip away from the rest of the team and make for the grassy flatlands near the Molonglo River which are now part of the town’s football field. The old bull loved the area so much that drovers passing through the area invariably found him on ‘the flat’ and, as the bull was nicknamed ‘Captain’, the area became known as Captains Flat. The Reverend W. B. Clarke, an enthusiastic geologist, discovered gold in the area as early as 1852. He reported his discovery to the local landholders who, not wanting thousands of prospectors all over their land, managed to keep the news quiet until 1874. By 1881 fossickers had found substantial deposits of reef gold and major mining operations opened up the area. The following year copper was found (which accounts for the denudation of the hills around the town) and by the late 1890s the town was booming. It was around this time that the town’s population reached 3,000 and it boasted five hotels, an oyster bar and a jeweller. By 1899 the mines were closing down and the town, like so many mining settlements, started to disappear. By the 1930s there were only about 150 people living in the town and most of the equipment which had been used in the 1890s had been removed. Then, in 1937, Lake George Mines built a 39 kilometre railway to Bungendore and with new drilling techniques and flotation plants reopened the whole area. Once again Captains Flat was successful. 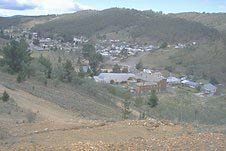 By the end of the 1930s it was second-only to Broken Hill as its mines produced vast quantities of gold, silver, lead, zinc (it was the most important of all the minerals being mined), copper and iron pyrites. By 1962 this flurry of mining was over. The railway line closed down and the town returned to a sleepy hollow once again. This is a place where the visitor should get out of the car and just wander around. There is the delightful hamburger joint called Grandma’s Goodies, the historic Police Station, Wilkins Park (beside the Molonglo River) has an historic water trough as well as good picnic facilities, and the old mine road (it can be approached from either the Jerangle Road just before Keatings Collapse or from the Captains Flat road before entering the town) takes the visitor to the top of the old mine works. This offers excellent views across the valley. The area has bits of old mining equipment and is still largely denuded as a result of the mining activities. There is a handy sheet ‘Captains Flat – The Real Australia’ which provides a good map with brief descriptions of most of the town’s attractions. Located at the northern end of town is the Yesteryear Museum. It is privately run and contains large displays of memorabilia from the early history of the town. Built during the second mining rush of the 1930s it is a hotel which reflects the size and prosperity of the town at the time. It is now an interesting irony that this town, with a population of around 500 people, boasts the longest bar in Australia. Although this claim is made for other hotels as well. 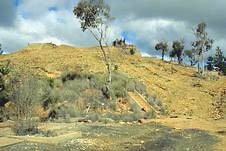 Not a witty observation about the 1993 Australian elections but rather an interesting example of what happens when a huge section of a hill collapses because it has been dug out by miners. It is easy to locate being about 400 metres beyond the Captains Flat Hotel on the Jerangle Road out of town. 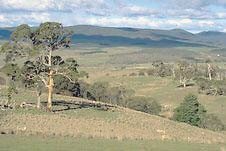 17 km south of Captains Flat is the entrance to Deua National Park which has picnic and barbecue facilities. The highlight of any trip to the park is to inspect the Big Hole, a limestone collapse which is nearly 100 metres deep and 50 metres wide. The walk to the Big Hole involves crossing the upper reaches of the Shoalhaven River and walking through some particularly beautiful countryside.